Your phpBB website has the ability to send email notifications, using your SMTP (Simple Mail Transfer Protocol) settings. 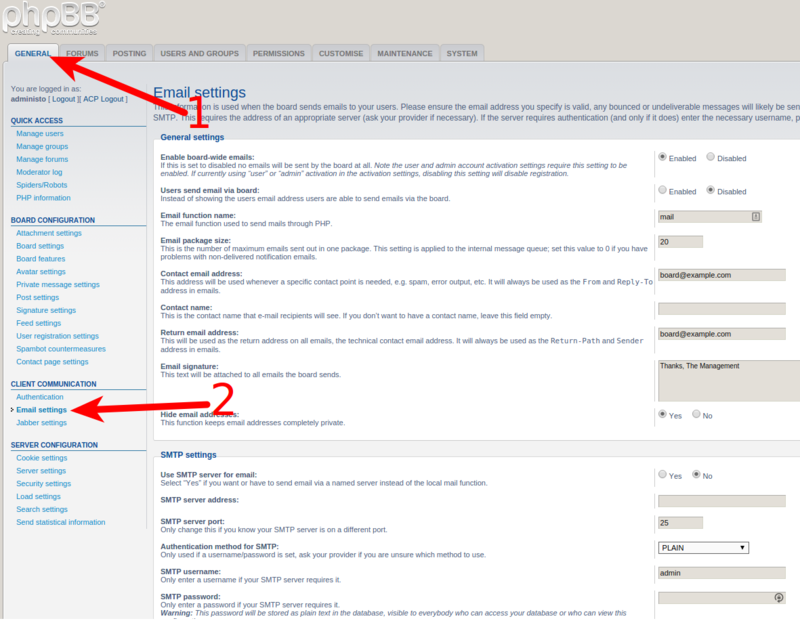 In this guide we will show you how to setup your SMTP settings in phpBB. You will then be able to send email notifications from your phpBB website. Login to your phpBB Admin Control Panel (ACP). Click the General tab, then Email settings in the Client Communication section of the menu. Fill in the fields as needed. Below is a description of fields, provided by phpBB. You can view your specific email settings in cPanel at any time. Enable board-wide emails If this is set to disabled no emails will be sent by the board at all. Note the user and admin account activation settings require this setting to be enabled. If currently using “user” or “admin” activation in the activation settings, disabling this setting will disable registration. Users send email via board Instead of showing the users email address users are able to send emails via the board. Email function name The email function used to send mails through PHP. Email package size This is the number of maximum emails sent out in one package. This setting is applied to the internal message queue; set this value to 0 if you have problems with non-delivered notification emails. Contact email address This address will be used whenever a specific contact point is needed, e.g. spam, error output, etc. It will always be used as the From and Reply-To address in emails. Contact name This is the contact name that e-mail recipients will see. If you don’t want to have a contact name, leave this field empty. Return email address This will be used as the return address on all emails, the technical contact email address. It will always be used as the Return-Path and Sender address in emails. Email signature This text will be attached to all emails the board sends. Hide email addresses This function keeps email addresses completely private. Use SMTP server for email Select “Yes” if you want or have to send email via a named server instead of the local mail function. SMTP server port Only change this if you know your SMTP server is on a different port. Authentication method for SMTP Only used if a username/password is set, ask your provider if you are unsure which method to use. SMTP username Only enter a username if your SMTP server requires it. SMTP password Only enter a password if your SMTP server requires it. Warning: This password will be stored as plain text in the database, visible to everybody who can access your database or who can view this configuration page. After filling in the fields, click the Submit button on the bottom. You are finished when you see a message stating "Configuration updated successfully." Congratulations, now you know how to setup SMTP settings in phpBB! You should automatically receive email notifications when new users register by default. You can subscribe to the forums to get notifications of new posts. This is the same info as in the Settings - how about suggested settings etc to help with trouble shooting? Sorry for the problems with phpBB (if you're having issues). We unfortunately do not have any troubleshooting documentation for it. If you can provide a description of the error, error messages, steps to duplicate problems and versions of the software, then we can investigate the issue for you.